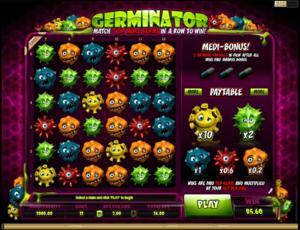 Germinator is an online video slot machine game released in November 2011. It is offered exclusively at online casinos powered by Microgaming. This video slot game has 6 reels and 12 pay lines. The theme of Germinator is inspired by a mix of two games – Dr. Mario and Bejeweled. What makes Germinator so different from other online slots games is that it deviates from the usual spinning reels. It actually looks more like a puzzle video game, think of a crossover of Dr. Mario and Bejeweled. Most people love to play this game because it gives them the opportunity to win many times even in small amounts. It actually beats the humdrum of spinning over and over again and trying to form random winning combinations. Germinator is created for all types of player levels, since this adorable slot game has coin denominations which range from 5 cents to $2. Players are given even more chances of winning in the Medi Bonus feature game, wherein they can eliminate a specific type of germ when they are able to collect 3 capsule symbols anywhere on the grid at the end of any game. Microgaming online slot games are available to players in 2 formats – download and no-download. Whether you like to download their software first or you prefer to play instantly without the need to download, then Microgaming surely has online slot machine games to accommodate your every slot gaming preference. Good thing that Germinator is available for instant play, so you do not have to download anything to find out if this game interests you in a way that you would like to spend some real money on it. Germinator is created for those who love playing Dr. Mario and Bejeweled as well as for those who have the desire to win some real money in small amounts yet at a continuous pace. The Germinator online video slot game features cascading reels, scatter symbols, a Medi Bonus Feature game, a maximum coin jackpot of 360, a maximum cash jackpot of $720, and it has a 96.85% payout ratio! The quality of the graphics and sound that Microgaming provides is absolutely fantastic and top notch. They have an impeccable reputation of making the most stunning graphics and true-to-life sound effects that will truly transport you to “that specific theme” they used in any of their slot games. Most people love to play games incorporated with Microgaming software because they have smooth animation and engaging yet non-interfering sounds. In Germinator, players are brought to a laboratory facility wherein germs are being cultivated in order to find out what kind of medicine can be effective enough to get rid of them. The germs are drawn and animated comically. They sneeze, cough, shrink, turn, bounce, and they even make goofy faces! When you hit the play button, instead of spinning, the lines go from left to right. The game play in Germinator has colorful graphics, so you will never get bored while playing this game. The overall graphic design of Germinator displays the amusingly vibrant colors of germs in a deep purple background, which include orange, red, blue and green. The constant background music and sound effects you will hear in this game resemble those in old arcade games that are simple but guarantees to bring a lot of fun! If you take your time on the next spin, you will see some of the germs sneezing, coughing, and even bouncing up and down for a short time. When you get winning combinations, you will hear popping sounds as the germs explode. Funky music is played out when you form winning combinations with 6 germs or more. Overall, the music and sound effects are so entertainingly creative and funny that it will surely keep you playing for a long time! There are no card deck symbols available in the Germinator online video slot game. The regular symbols that you will find in Germinator are germs distinguished by their color: Yellow, Green, Blue, Red, and Orange Germs. There is no Wild Symbol available in the Germinator online slot game. The Scatter Symbol is the Capsule. The scatter symbol is not required to appear in a line (on an enabled pay line) for you to win. The Capsule scatter symbol can be found scattered anywhere on the reels, and you are able to form winning combinations as long as there are 3 or more Capsule scatter symbols that appear anywhere on the grid. If you manage to get 3 or more Capsule scatter symbols anywhere on the grid, you will activate the Medi Bonus Feature game. Please take note that the Capsule symbols do not give out any winnings; however, they are your ticket to enter and play the Medi Bonus Feature game. Medi Bonus Feature Game – If you manage to get 3 or more Capsule scatter symbols anywhere on the grid at the end of any game, you will activate the Medi Bonus Feature game. All you have to do is choose a germ type, click it, and all of the symbols identical to it in the grid will be removed. There will be no payouts given to you for getting the Capsule scatter symbols. There will be no payouts given to you for the first set of germ symbols removed at the beginning of the game. When germ symbols are eliminated and explode, new germ symbols will fill in the empty spaces of the previous ones. It is possible for you to win further without any extra cost. All of your winnings are calculated via multiplying the multiplier amount won for each symbol by your pay line bet amount. If you manage to get 3 or more Capsule scatter symbols at the end of Medi Bonus Feature game, you will re-activate the Medi Bonus Feature game again! Once the Medi Bonus Feature game is over, you will be then taken back to the main Germinator online slot game, and your winnings from the bonus game will be included to your overall balance. Germinator has 6 independent reels where you may bet on 12 fixed pay lines. The minimum bet is 0.60 and the maximum bet is 24.00 per pay line. You can wager only 1 coin per line bet. Therefore, the maximum bet amount is 24.00 per spin. The maximum payout in the standard Germinator online video slot game is 10x your line bet. Since the game play is very entertaining, the Germinator online slot game is not equipped with an Autoplay function.